Charlotte has been dancing at JC Dance since she was about 6 years old and attends Ballet, Tap, Modern, Commercial and Limbering classes. Charlotte has been awarded Student in the Spotlight for September because she is very hardworking, committed and consistent in her classes. In the run up to show she has attended lots of extra ballet classes as her part in Snow White has needed her to interact with different groups, some weeks she has had a lot of dance!! In the summer Charlotte auditioned for two extra dance opportunities; the first was to be an associate at a dance college and the second to be a member of Fylde Coast Youth Dance Company; she was successful in both and after some thought decided to go for FCYD…so far she is loving it and is enjoying learning lots about contemporary dance technique, her first performance with the company is next week at the Grand Theatre, Blackpool. 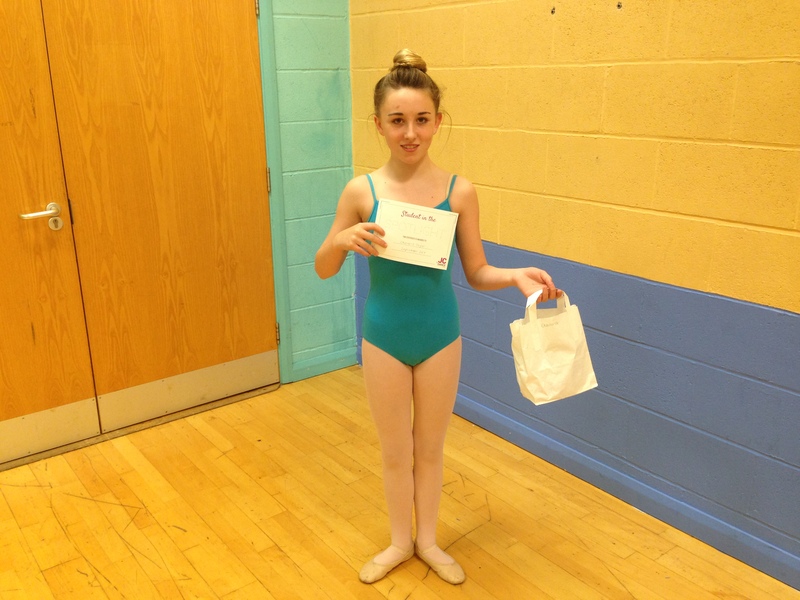 Here she is with her certificate, and she also received a winners t shirt… Well done Charlottel!